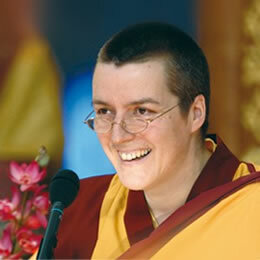 Gen-la Dekyong is a highly experienced Buddhist Teacher who has taught at many different centres internationally. Before her appointment as General Spiritual Director she was the National Spiritual Director of the USA. She is a very powerful Teacher able to make Buddha’s teachings easily accessible and to show through her example how to integrate these teachings into our daily life. Gen-la has dedicated her life to helping spread Kadampa Buddhism throughout the world by developing meditation centers and Temples in as many countries as possible, and she provides enthusiastic support and encouragement to everyone engaged in these projects. But busy as she is, she never loses her connection with the people she is dedicated to helping and always has a kind word and wise counsel for whoever she meets. Gen Kelsang Jampa, an American Buddhist Monk, is the the NKT-IKBU National Spiritual Director for the US and the Resident Teacher of KMC Texas. He has been a disciple of Venerable Geshe Kelsang Gyatso for many years and has received the lineage blessings and oral transmissions directly from him. Gen Jampa’s warmth, kindness and deep understanding of Buddhist teachings provide an inspiring example of Buddhism in practice.